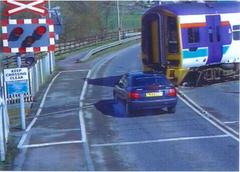 Misuse of level crossings (LXs) has for some years posed the greatest risk of death or injury faced by rail passengers. The risk of collision has been reduced to a small fraction of what it was, and the withdrawal of slam-door carriages has eliminated the risk of falling out of an open door. What remains is no larger an absolute risk than it was 10 years ago, but it now represents the biggest single hazard. The rail industry has been very good at identifying and managing the risks over which it has control. It has mounted very successful campaigns to reduce the risk to young people of trespassing on the railway by explaining - often graphically - the outcome of fooling with 25kV cables, or of being hit by a train while fooling around. These are often fronted by prominent sports figures, or other likely rôle models for older children. It has spent millions of pounds improving and reinforcing fencing at high-risk areas and at depôts. You'll have noticed how much prominence in the media - the tabloid press in particular - to stories about deaths on the railway, whether of passenger, track worker or "innocent" child trespasser, and how this contrasts with the almost total lack of coverage, certainly in the national media, about similar deaths in road traffic accidents. This is because accidental deaths on the railway are very rare - low double figures a year - compared with around 3000 on the roads. And this is where the heart of the LX problem lies. After the incident at Bunchrew a couple of years ago there was a newspaper article which suggested that some 4% of LX misuses were the responsibility of the rail industry. Network Rail does not accept this figure, which wasn't substantiated at the time, but let's accept it for the moment. That means that 96%, or 24 out of 25 incidents, are the responsibility of the road user. Mostly this is a vehicle driver but occasionally it will be a pedestrian who takes the risk. Sometimes it will be a child. Every death is a tragedy for those involved - kids on a LX no less (nor any more) than adults in a road traffic accident. The problem the safety authorities have to face is how the risk can be reduced. Discuss this with highways agencies and you'll find that they have no funds to devote to eliminating what are, in their terms (3000 a year), very few deaths - they have bigger pressures on their budgets. It's seen by the entire road "industry" as the railway's problem. And so it was until the recent Transport Act which laid a duty on local authorities and the Trunk Road Agencies to assume some responsibility for LX safety, and to co-operate with (including providing resources to) the railway industry in reducing the risk. Sometimes this will be by closing a crossing altogether, providing a bridge; sometimes it will be upgrading an open crossing to one with barriers; sometimes it will involve nothing more than improved signage or visibility. To do this NR carries out regular LX inspections and each crossing is rated according to its use by road traffic (including pedestrians) and rail traffic. Priority is given to sites with the highest calculated unmitigated risk, and work is carried out in the appropriate way for that site. The blanket road lobby answer of reducing train speeds just won't do - what is needed is better education of road users and better enforcement of the existing law. Remember the 96% caused by road user misuse. In Part 2 I shall describe some of the technical problems and outline what improvements can be expected. I will report on the LX presentation which ORR's Rail Industry Advisory Committee (RIAC) will see next month. I shall also have more to say about Bunchrew and Delny.